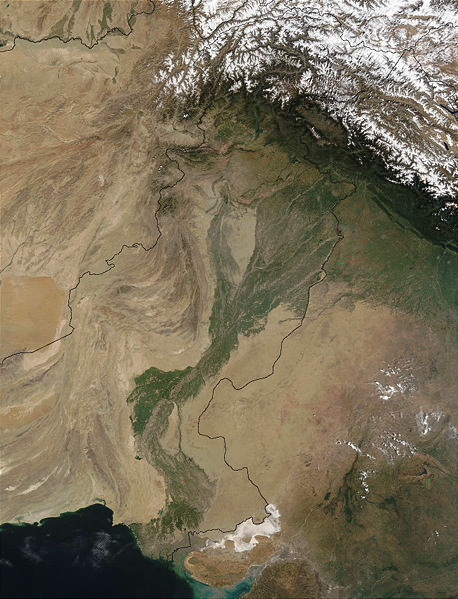 A chaos of water flowing down from mountains in the north formed tributaries that merged into the Indus River. Sometime around 6000 BCE a nomadic herding people settled into villages just west of the Indus River. There they created order for themselves, growing barley and wheat using sickles with flint blades, and they lived in small houses built with adobe bricks. After 5000 BCE the climate in their region changed, bringing more rainfall. Apparently they were able to grow more food, and they grew in population. They began domesticating sheep, goats and cows and then water buffalo. Then after 4000 BCE they began to trade beads and shells with people in the distant areas of central Asia (around the Caspian Sea) and other areas west of the Khyber Pass. And they began using bronze and working metals. With time and experience they were improving their technology. The climate changed again, bringing still more rainfall, and on the plains along the Indus River grew jungles inhabited by crocodiles, rhinoceros, tigers, buffalo and elephants. By around 2600, a civilization as grand as that in Mesopotamia and Egypt had begun on the Indus Plain and surrounding areas. They had covered sewers and, drainage systems beneath their streets. By 2300 BCE this civilization reached maturity and was trading with Mesopotamia. Seventy or more cities had been built, some of them upon buried old towns. There were cities from the foothills of the Himalayan Mountains to Malwan in the south. There was the city of Alamgirpur in the east and Sutkagen Dor by the Arabian Sea in the west. One of these cities was Mohenjo-daro (Mohenjodaro), on the Indus River some 250 miles north of the Arabian Sea, and another city was Harappa, 350 miles to the north on a tributary river, the Ravi. Each of these two cities had populations as high as around 40,000. Each was constructed with manufactured, standardized, baked bricks. Shops lined the main streets of Mohenjo-daro and Harappa, and each city had a grand marketplace. Some houses were spacious and with a large enclosed yard. Each house was connected to a covered drainage system that was more sanitary than what had been created by the civilization in Mesopotamia. 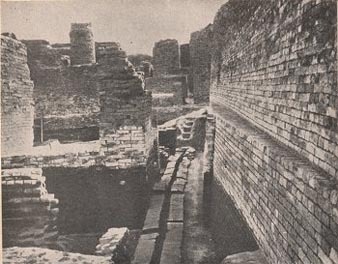 Mohenjo-daro had a building with an underground furnace (a hypocaust) and dressing rooms, suggesting bathing was done in heated pools, as in modern day Hindu temples. The people of Mohenjo-daro and Harappa shared a sophisticated system of weights and measures, using an arithmetic with decimals. Whether these written symbols were a part of a full-blown written language is a matter of controversy among scholars, some scholars pointing out that this and the brevity of grave site inscriptions and symbols on ritual objects are not evidence of a fully developed written language. The people of Mohenjo-daro and Harappa mass-produced pottery with fine geometric designs as decoration, and they made figurines depicting their attitudes. They grew wheat, rice, mustard and sesame seeds, dates and cotton. And they had dogs, cats, camels, sheep, pigs, goats, water buffaloes, elephants and chickens. Then, between 1800 and 1700 BCE, civilization on the Indus Plain all but vanished. What befell these people is unknown. One suspected cause is a shift in the Indus River. Another is that people dammed the water along the lower portion of the Indus River without realizing the consequences: temporary but ruinous flooding up river, flooding that would explain the thick layers of silt thirty feet above the level of the river at the site of Mohenjo-daro. Another suspected cause is a decline in rainfall. Agriculture declined and people abandoned their cities in search of food. Later, a few people of a different culture settled in some of the abandoned cities, in what archaeologists call a "squatter period." Then the squatters disappeared. Knowledge of the Mohenjo-daro and Harappa civilization died – until archaeologists discovered the civilization in the mid-19th century.